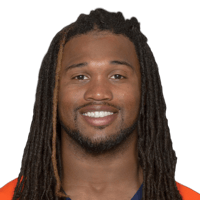 Published: Nov. 8, 2015 at 07:47 p.m.
Broncos Omar Bolden returns punt 83 yards for a touchdown. Published: Dec. 23, 2014 at 12:01 a.m.
Denver Broncos cornerback Omar Bolden returns Cincinnati Bengals kicker Mike Nugent's kick for 77 yards. Wk 13 Can't-Miss Play: Where's the football? Published: Nov. 30, 2014 at 10:46 p.m.
Kansas City Chiefs cornerback Marcus Cooper doesn't see the football as it hits his leg and is recovered by the Denver Broncos.